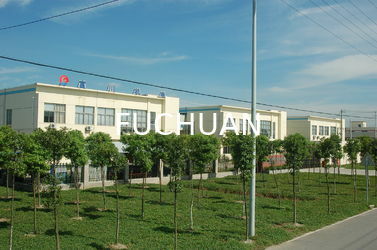 Fuchuan Electrical & Mechanical Co., Ltd was founded in 2001. It is located at Huaqiao Economic and Technological Development Zone of Kunshan City ,Jiangsu Province, neighboring Shanghai city, the junction of Shanghai-Nanjing Expressway and 312 State Highway. The company is a high-tech enterprise , specialize in design, development, manufacture, installation and debugging of wire and cable equipment. 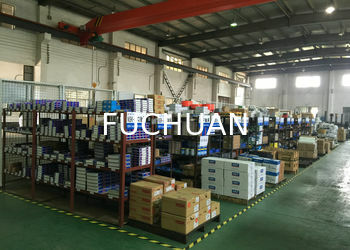 The company has introduced advanced equipment and technology from developed countries such as Japan, Europe and the united states since its establishing, successfully develop equipments of electric wire and cable, which is close to and achieve the industry international advanced level such as new type of high speed bunching machine, high speed extruder, high speed annealing & tinning machine, cable-laying machine as well as various periphery equipments of electric wire and cable. The company has being provided equipment for many famous enterprises at home and abroad, such as Sumitomo Electric Co., Ltd, HITACHI Cable Group Limited, Hewtech Wire Co.,Ltd, Kurabe Industrial (shanghai) Co.,Ltd, Hayakawa Electric Wire Co.,Ltd, Shanghai Bandong Electrical Wire Co., Ltd., Jiangxi Copper Corporation, Xinhui Copper Co., Ltd, Force Group, Tony Electronic Group, Jiangsu Jiangyang Cable Co., Ltd, Huasheng Group, Zhengxiong Copper Group, Qingdao Hanhe Cable Co.,Ltd, Jiangnan Electri cable, Tianjin 609 Cable Limited , Zhongli Sci-Tech Group, Wantai Group and Tbea Deyang Cable Co.,Ltd and so on. The company is always winning a rather good reputation from these enterprises. In December of 2009, we built a new plant in Weiliu Road Economic Development Zone of Dongtai city in Jiangsu Province and occupies an area of 21,000 square meters, set up su-branches in Dongtai city of Jiangsu, in which with production for main body. And set up headquarters in Huaqiao of kunshan, in which with develop new product, marketing and after-sale service for main body. With the rapidly developing of company, introduce the ERP manage system, National Product Safety Standard System, ISO9001:2008 , it has already possess advanced production and processing equipment、well-trained manage team and professional technicians, improve our competitive power greatly. The company forever insist on the operation principle of “customers first, sincere services and common development”, providing the highest quality products as well as perfect service to customers. Sincerely invite the manufacturers to visit, inspect and guide our company. 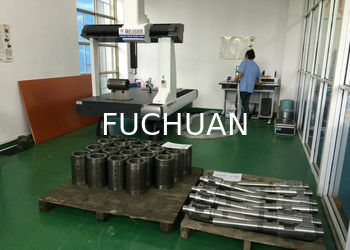 Fuchuan would like to be your most sincere partner! 1. 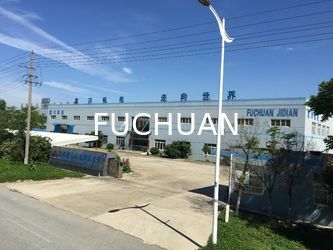 In February 2001, Kunshan Fuchuan Electrical Machine Plant was founded. It was specialized in design, development, manufacture, installation and debugging of wire and cable equipment. 2. In November 2002, the plant cooperated with Hewtech Electronics Co., Ltd.
3. In February 2003, the plant cooperated with Oupu Company. 4. In March 2004, the plant cooperated with Jiangnan Cable Company. 5. In June 2004, the plant cooperated with Hongqi Cable Group. 6. In August 2005, the plant cooperated with Sumitomo. 7. On June 21, 2006, the plant was renamed as Kunshan Fuchuan Machine & Electricity Technology Co., Ltd.
8. In September 2006, the company cooperated with Zhen Xiong Copper Co. Ltd.
9. In March 2007, the company cooperated Zhongli Science and Technology Group Co., Ltd.
10. In April 2007, the subsidiary Kunshan Sanyou Copper Product Plant was founded. 11. In May 2007, the company successfully launched FC-250B novel high-speed wire twisting machine, which can at least twist seven wires with the diameter of 0.03. 12. In September 2007, the annealing tinning machine and the high-speed wire twisting machine entered Thailand Zhen Xiong Company. 13. 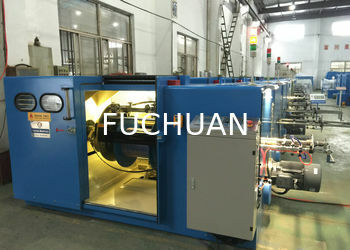 In November 2007, FC-650B high-speed wire twisting machine entered European market. 14. 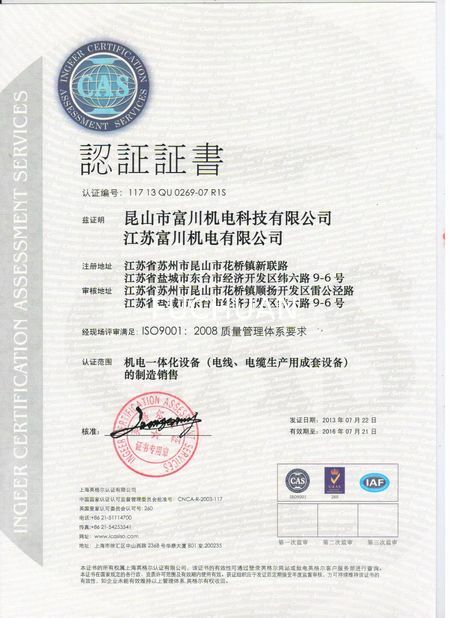 On January 14, 2008, the company passed ISO9001:2000 Quality Management System. 15. In January 2008, the company cooperated with Xindian Group. 16. In April 2008, the company cooperated with Huasheng Group. 17. On July 23, 2008, novel high-speed wire twisting machine of the company was patented. 18. In August 2008, the company successfully launched FC-200B novel high-speed wire twisting machine, which can at least twist seven wires with the diameter of 0.016. 19. 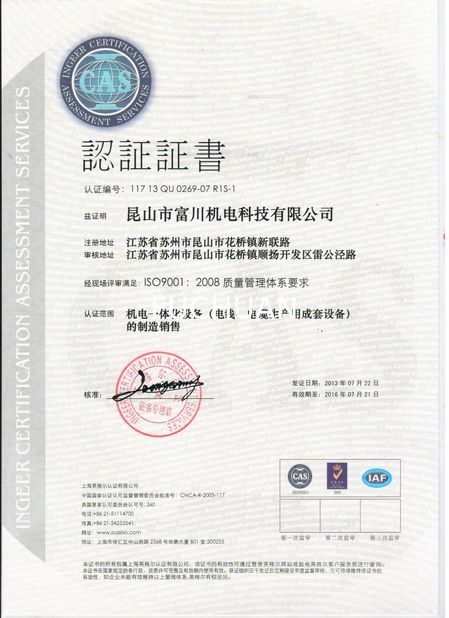 In November 2008, the company cooperated with TBEA (Deyang) Co., Ltd.
20. In May 2009, the company successfully launched FC-T12 hairline annealing tinning machine, which can twist wire with the minimum diameter of 0.016. 21. In May 2009, the company cooperated with Wantai Group. 22. In December 2009, Jiangsu Fuchuan Machine & Electricity Co., Ltd. was founded. 23. In April 2010, the company successfully launched FC-650C novel high-speed wire twisting machine, which was handed to Fuchs Group for use. 24. In May 2010, the company successfully launched FC-800B novel high-speed wire twisting machine, which was handed to Qunhui Company. 25. In November 2010, the company successfully launched FC-T16 hairline annealing tinning machine. 26. In August 2011, the company successfully launched FC-1000B high-speed pair twisting machine. 27. 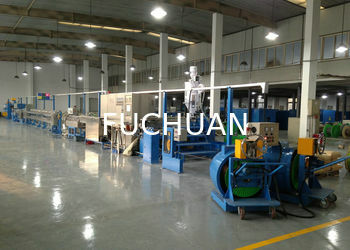 In September 2011, the company successfully launched FC-300 double-winding wire twisting machine. 28.In April 2012,the plant successfully launched FC-300 no twist bunching machine.The finished wire is straighten naturally,do not twist. 29. 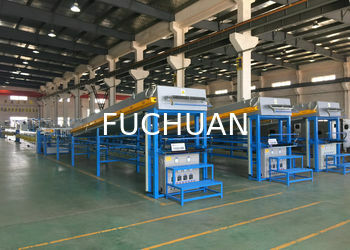 In May2012,the plant successfully launched FC-1250 high speed double twisting machine. 30.In Feb2013,the plant introduce into the ERP manage system. 31.In March2013.the new product 1+6+12high speed bunching machine have been developed,with high productivity(it is 4.5times than tube machine for the 1+6+12 conductors normal bunching),low power,small floor place,low noise and other merits. 32.In May 2013.the plant introduce the National Safety standard produce system. 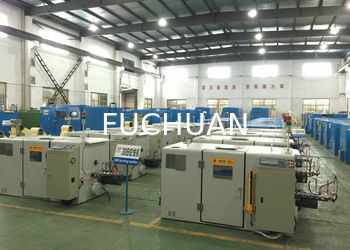 33.In June2013.the plant successfully launched the FC-500 twins bunching machine,easy to operate,small floor,save the 30% power and other merits. in designing and manufacturing mechanism equipments of electric wire & cable. research,specialized design,manufacture possibilities and excellent market brand effect. so as to instruct clients to make some relevant adjustment for product. use and preserving product knowledge timely. craft for them to illustrate. advance.Not betwen,the two sides recognized coordination,put words to date. and so on,our after-sale servicemen will rushed to scene within 24 hour. 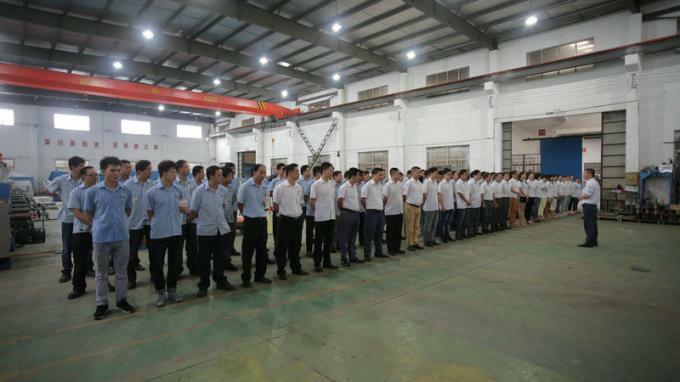 Our company established in 2001,which through nine year's continuously innovation and development,now we have 168 staffs since the time of its establishing.